DigiSender HD HDMI-SPLIT-T-PRO is revolutionary new Ethernet cable data solution which creates an instant HDMI distribution system over your exiting LAN network. You can add up to 16 HDMI sources to your existing Ethernet cable network. These sources can be accessed using any number of receivers. 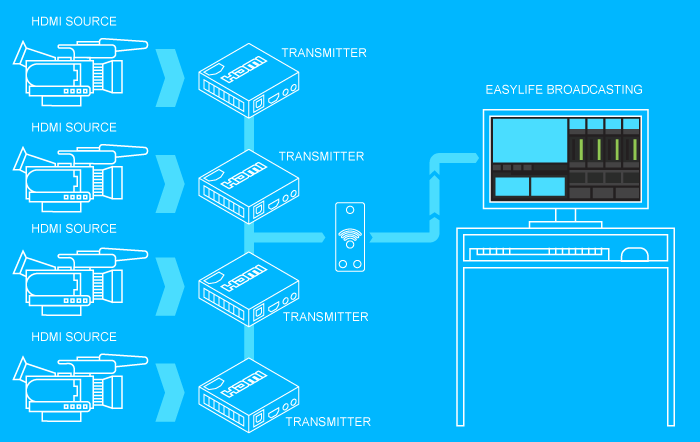 Simply connect a receiver to your network and select which transmitter you wish to receive from and the source will be displayed on the connecting monitor. Use the HDMI Network Injector Transmitter with any of our Apps or Network video products offered by AEI. Compatible with Easylife Pro CCTV System and DigiSender LIVE Pro for Facebook. Each transmitter features a switch bank that enables you to set an ID code which can be between 1 & 16. The receiver can then be adjusted to select the source you wish to display. You may be familiar with HDMI over Ethernet as a point-to-point solution which is common practice but this system is cascade-able allowing the HDMI to be split (or forked) using standard Ethernet hubs, or even added to an existing LAN network. 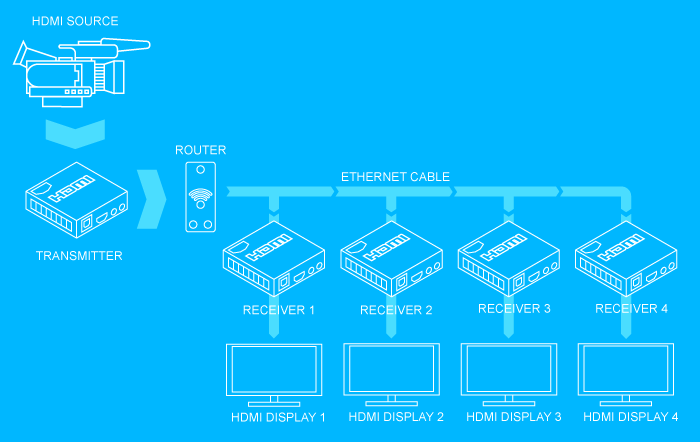 It means that you can Broadcast HDMI over your local LAN and receive the broadcast on any number of receivers. It acts as a HDMI Broadcaster as well as a splitter. Start with a HDMI-SPLIT-T Extender at the source end and a HDMI-SPLIT-T Receiver at the display. A single cable between the two and your job is complete. Or you can add up to a mind-blowing 253 HDMI-SPLIT-T Receivers to your Ethernet cable network. This means as an installer, if your client asks you to add further displays all displaying the same source provided they are looking for no more than 253 you do not need to sweat. As a bonus it works over existing LAN networks which means that for many applications existing LAN cable infrastructure can be used and you retain all the configuration of your existing LAN network. 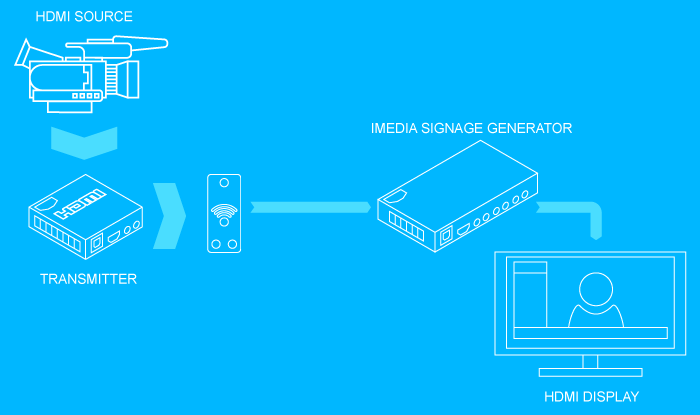 It is designed specifically for television, CCTV and highly integrated digital signage display networks. If you use just one broadcaster HDMI-SPLIT-T Transmitter the broadcast can be integrated with our digital signage products to provide an unprecedented level of flexibility. Because it uses standard Cat5/5e/6 Ethernet LAN Cable or existing LAN infrastructures you can create a modular world beating network of display devices. With stunning HD1080 & 4K UHD Options picture quality and rock solid performance compares only with our formidable fibre optic series. Create unsurpassed ultra high-definition performance but if you are looking for greater distances see our revolutionary DigiSender Fibre Optic series which provides truly amazing performance at 4K with any range. See Fibre Series. Remember, DigiSender has network growth in-mind, our modular and quick deployment approach allows for the system to be enhanced to create greater display complexities, split or further enhance your network. This concept means your network is ready for future enhancements and as an installer you may well find you are operating in familiar territory. How it works: The transmitter broadcasts the HDMI video source over your local LAN. You can also use as many receivers as you want on the same network. It only consumes one video/audio payload of your network bandwidth and will not burden your network with multiple streams as you add more receivers. It also means that the number of receivers is limited only by the available IP addresses so if you are using an existing network that has computers and printers operating then the total number of issued IP addresses cannot exceed 255. Therefore, the max number of receivers you can use on any one network is limited only by the number of available IP addresses.